Pure Genoa in its veins. Although the Church of San Giorgio is not the only basilica in Genoa with ancient origins and the soldier-saint is not the city’s patron saint, the cult of Saint George and the importance given to the church that bears his name hold exceptional significance here, especially from the crusades onwards, when the image of the saint slaying the dragon beneath the flag with the red cross was borne throughout the whole of the Mediterranean region. The church has an octagonal layout: visitors experience the emotion of entering a space that expands and directs their gaze towards the void of the dome, illuminated by large windows. Of particular note among the church’s rich decorations are the frescoes and paintings by major artists from Genoa and beyond such as Domenico Piola, Luca Cambiaso (the Martyrdom of Saint George), Claudio Cohelo, Santo Panario, Giuseppe Isola and Domenico Guidobono. The exterior, with its mid-nineteenth-century Neoclassical style, melds with the architectural fabric of the old part of the town in an original manner: the wide, gently curved façade and the elegant play of the white-plaster decorations set against a pastel green background creates a fine contrast with the narrow depth of the alleyways. Also worthy of note, finally, is the campanile or bell tower which has been incorporated into a nearby house, a reworking of the medieval Allmerica Tower. It is thought that the sacred site was dedicated to the Cappadocia saint when it was first consecrated, soon after the cult of Saint George had reached Genoa with the Byzantine army of which he was the protector. 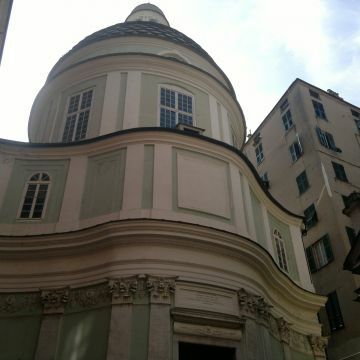 The bond between the army and the soldier-saint would remain in place for centuries; for instance, the church of di San Giorgio, Sanctuaries Della Patria (Sanctuary of the Homeland) housed the standard of the Republic, which was delivered to the captain general of Genoa’s armada when setting sail on a mission. The Byzantine church was erected on an area of the ancient Roman Forum: a rare, flat open space at the juncture between the natural harbour of the old port and the original settlement – then castrum – on the hill of Salzano. To give an idea of the importance of this site, the piazza served as a starting point for measuring the distances in Roman miles along Via Aurelia and Via Postumia, which crossed paths here. [This practice gave rise to a series of place names referring to milestones such as Quarto, Quinto and Sestri (IV, V e VI milium ab urbe juanua), Pontedecimo (Pons ad X milium).] The fact that these place names have survived to the present day is indicative of the role played by this crossroads of major routes in shaping the region through the millennia. Over the centuries, even after the fall of the Roman Empire, the Forum retained its function as the centre of city life: in the Early Middle Ages it was a gathering place for people and the site of a busy market. The earliest reliable sources on the church date to 964, and it is believed that during the first centuries of the new millennium the original basilica or chapel became a collegiate church. 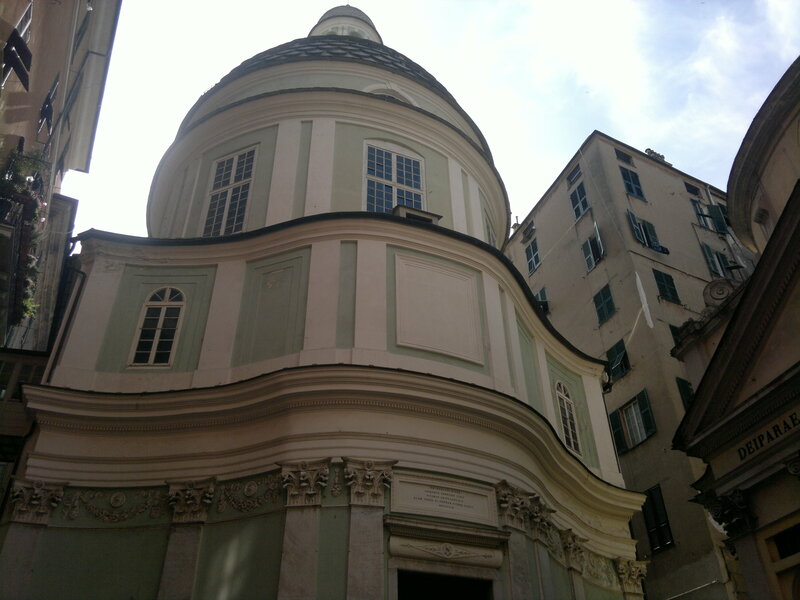 The church has been rebuilt time and again throughout the centuries, taking on new forms on each occasion, for instance in the sixteenth century and once again at the beginning of the seventeenth century when it was given a new lease of life by the Theatine Fathers based on a design by the architect Giacomo Lagomaggiore.